A blog about science, mathematics, coding and nerdy shirts. We’re pleased to announce two new nerd shirts inspired by mathematics, physics and grinning spheres. It’s based on the Banach-Tarski Theorem, which states that a ball can be cut into a finite number of pieces, which can then be rigidly rearranged into two identical copies of the original ball – breaking physical conservation laws! Incidentally, the Banach-Tarski Paradox is referenced in the Futurama episode Benderama, in which a character makes an overwhelming number of copies of himself. 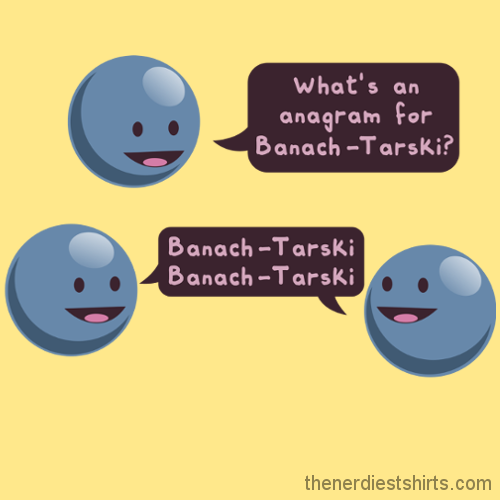 You can get the Banach-Tarski nerd shirts at our online store. 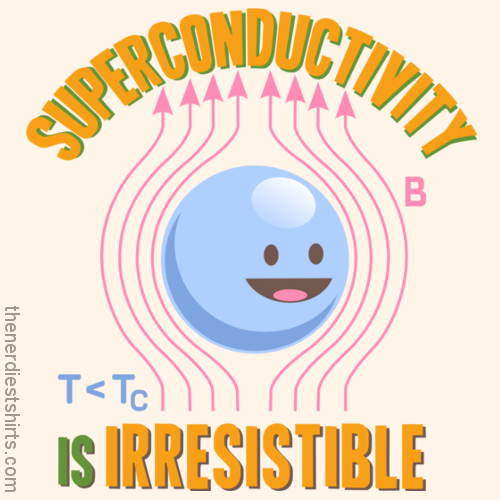 The second new nerd shirt sports the slogan “Superconductivity is Irresistible.” The grinning sphere in this case is a superconducting material that’s cooled below its critical temperature, when the state of zero resistance is reached. Below this critical temperature, an applied magnetic field cannot penetrate the superconductor, a phenomenon known as the Meissner effect. We actually had some heated debate whether this shirt should instead say “Physics is Irresistible” (same diagram). We went with “Superconductivity,” but this design isn’t set in stone. At this time, our shirts are custom printed-to-order. This allows us flexibility in design and you can choose from a wide variety of shirt styles and colors. Which slogan do you prefer? The Superconductivity nerd shirts are now available at our online store. Click on the image to zoom in on the design. Engineers, mathematicians, and physicists all love the Fourier transform. When we hear about the Transformers movie, we keep thinking about Fourier Transformers, with Oscilloscope Prime leading the noble Autocorrelationbots against the nefarious Decepticonvolutions. Look heroic (and nerdy) with our Oscilloscope Prime math shirt! The Fourier transform converts functions of time into their frequency components. In other words, it expresses the function as a superposition of a continuum of complex waves of pure frequencies. When you view nature from afar, the scientific description of evolution may seem no more plausible than the religious idea that we were created by a supernatural being as we are today. When you look into the actual details, however, the evidence supporting evolution is overwhelming. Phenomenon after phenomenon supports the ideas of common ancestry and change over time. Biologists, immersed in the details of real organisms, overwhelmingly support evolution. Charles Darwin pointed out many vestigial parts of the human body in The Descent of Man. Vestigial does not mean that the parts have no conceivable use, but rather that they are vestiges or remnants of a more functional past organ. May 25th was designated Nerd Pride Day / Geek Pride Day in 2006 in Spain. Since then, it has spread through blogs to the rest of the world. This year there will be physical gatherings, special programs on The Science Channel, and general internet euphoria. We suggest wearing something very nerdy. Every day. To us, nerdiness means appreciation and understanding of science, mathematics, and technology. We nerds appreciate the beauty of art and nature, but also the elegance of powerful ideas. We think the world becomes more wondrous and more interesting as we understand more of it. Sometimes nerdiness is expressed professionally, but you don’t have to be a scientist to enjoy science, as shown by the strong popularity of the Discovery Channel, NOVA, and other programs aimed at the interested public. We’re big fans of some areas of science we didn’t study in school. At the intersection of set theory, number theory, and combinatorics is the Calkin-Wilf tree, a beautiful and relatively recent mathematical construction.